UNC students are part of a national campaign to boycott Wendy’s over what critics say is its immoral treatment of the farmworkers who pick the fast food chain’s produce. 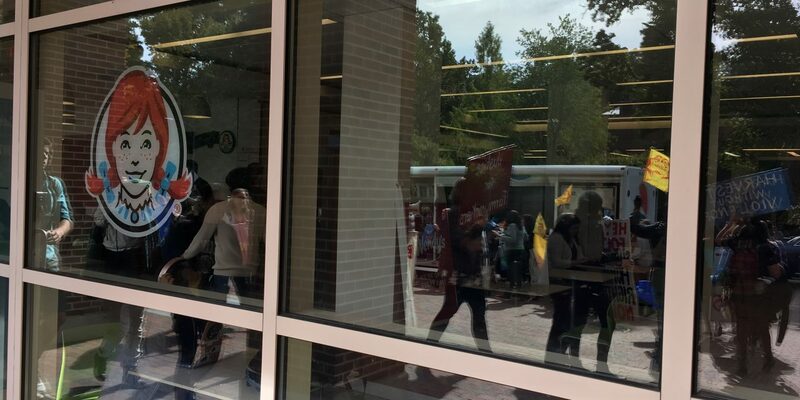 Earlier this week, UNC student advocacy groups that work with farmworkers organized a march from the Wendy’s on Main Street in Carrboro to UNC’s on-campus Wendy’s. President of the Chapel Hill – Carrboro NAACP Anna Richards attended the march on Tuesday and talked to WCHL’s Aaron Keck afterward. She said the event was a great opportunity to call attention to the plight of the folks who literally put food on our table. Organizers take issue with Wendy’s absence from a list of major fast food companies to join the Fair Food Program, an agreement between major food purchasers like McDonald’s and the Coalition of Immokalee Workers, who represent farmworkers and are pushing for safer work conditions and better pay. Since launching in October 2014, the Fair Food Program has had several national food chains sign onto the agreement, including Chipotle, Trader Joe’s and Subway. Last Sunday, UNC students also organized a vigil held outside of the UNC Wendy’s in a show of solidarity for farmworkers’ rights. But Wendy’s alleged unfair treatment of workers extends way past the fields where its produce grows, Richards said. She added the low prices Wendy’s, or many other national fast food chains, can offer customers are made possible by the meager wages paid to in-store staff. The NAACP has partnered with organizations involved in the national Fight for 15 campaign that advocates for higher wages for fast food workers. The North Carolina NAACP has partnered with organizations campaigning on the Fight for 15.